For the past few years, we’ve put a lot of focus on our off-road products with many of them getting bigger tire clearance, more accessory options, and better component compatibility. Well, we finally had time to dust off our pavement design notebook and inject some of those same ideas into a bike not intended for the off-road apocalypse. Today, I introduce to you the Midnight Special: a road bike with, you guessed it, bigger tire clearance, more accessory options, and better component compatibility. In the past, the Pacer has been our pavement solution; however, as components, riding styles, and rider expectations have evolved, the Pacer has turned into more of a classic design. The Midnight Special is rooted in the Pacer, with similar geometry and frame stiffness, but it goes beyond that design by offering things like 650b+ tire fitment, flat mount disc brakes, and accessory mounts to bedazzle it with any bells and whistles a rider might want. Standard information like spec and geometry can be found on the Midnight Special page. The purpose of this blog is to fill in some of the gaps, go into a little more detail, and answer some of the questions you may have about this new Surly offspring. “Road Plus” is currently the marketing name given to larger volume 650b road tires that have a similar diameter to more traditional 700c skinnies. It’s the same concept found in bikes like the Karate Monkey, which will run 27.5 x 3.0 or 29 x 2.4 tires without effecting the geometry. Same as off-road, the larger volume road tire offers a smoother ride, more control, better traction, and an NFG attitude. The Road Plus platform thrives where the surface is not perfect. The lower tire pressure absorbs all the road chatter and the larger contact patch allows the tire to easily track down the road and avoid following cracks and ridges. A rider can just relax and ride versus nervously bobbing and weaving down the street to avoid obstacles. If you live where the streets are crap, you know exactly what I’m talking about. Lower tire pressure also makes it a lot easier to set up tubeless, which is nice. Please note that the Alex rims which come stock on the Midnight Special are not officially tubeless ready. I won’t say it is impossible to set them up without tubes, but Surly cannot officially endorse that endeavor. Sorry folks. What is the compromise to Road Plus? Well, the larger volume 650b tire is heavier than what is possible in the narrow 700c world. 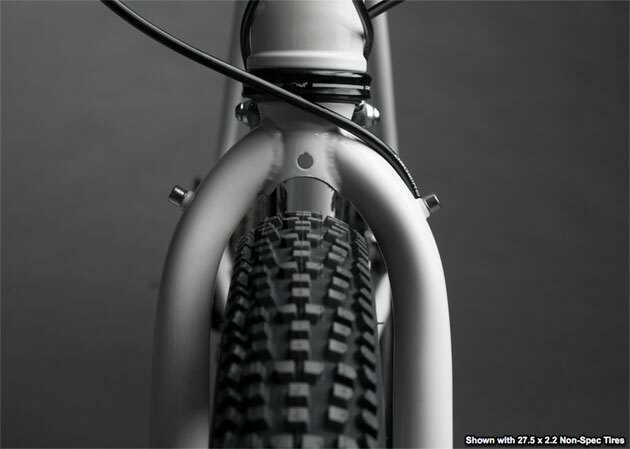 Not only that, the larger 650b tire works better with a wider rim, and that will also add a little weight. The slight addition to wheel weight won’t matter to many folks, but I feel compelled to inform. What size tires will the midnight special fit? The Midnight Special can fit pretty much any road wheel/tire combo you want to attach to it. If you want to lace up some pizza cutters and see what the max pressure of your tire pump is, game on. If you want to enjoy the cush life of Road Plus, this bike can be your ticket. As always, we are giving you options. Max tire clearance for the Midnight Special frame is 650b x 60 (27.5 x 2.35in) or 700c x 42. 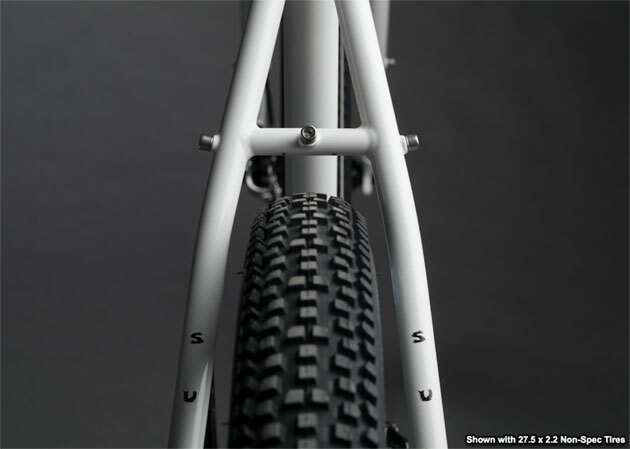 The current complete bike tire spec is 650b x 47. On the flip side, the smallest tire combinations we recommend are around 650b x 45 or 700c x 28. What size riders does the Midnight Special fit? A good size range is always important to us and we did what we could with the Midnight Special to fit as many shapes and sizes of people possible. The effective toptubes range from 500–625mm across eight different frame sizes (40 to 64) and our hope is that this spread will work for riders between about 5’0” and 6’8”. What kind of brakes does it have? 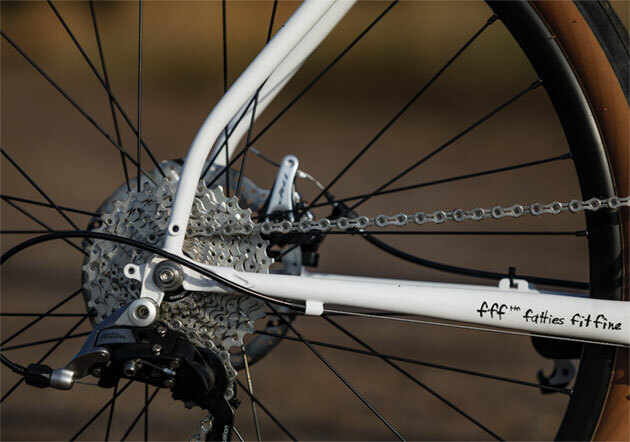 The fork and frame are designed around the flat mount disc brake standard. Additionally, we made sure there is enough room on the frame and fork to run post mount brakes with adapters if you so please. Those old BB5’s you have sitting in your parts bin will work just fine. Sure, as long as the off-road isn’t too gnarly, game on. 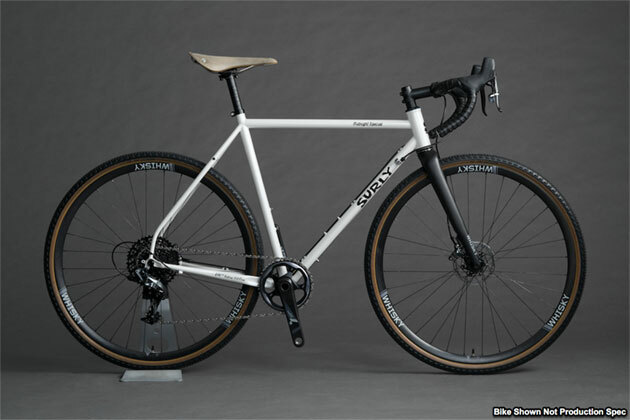 The geometry of the Midnight Special is road bike, but the frame is built to be dependable and some gravel or smooth off-road is perfect. The steel frame and larger tires do their best to absorb bumps, while the increased tire traction allows riders to point the bars at any obstacle with confidence. Can I put racks and fenders on it? Yes, the Midnight Special has enough accessory mounts to make it a blank canvas. 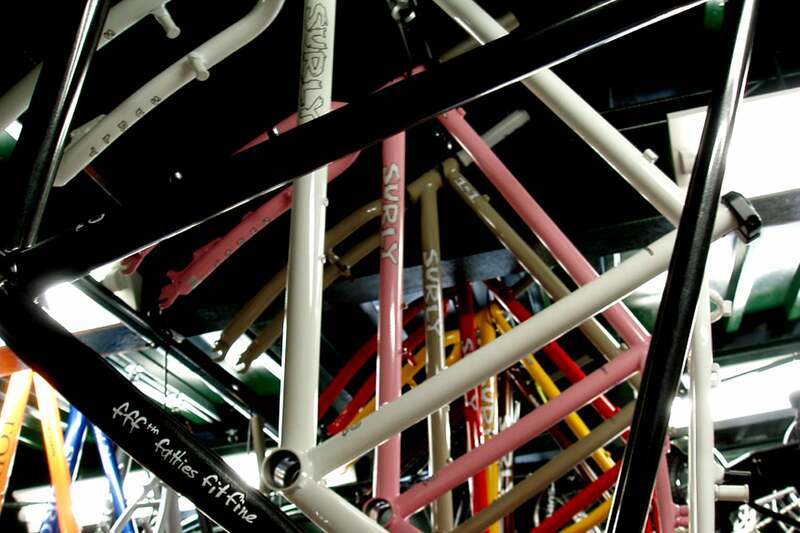 The frame will not hold anyone back from customizing their bike exactly how they want it. Pretty much any rack and/or fender will mount up just fine. 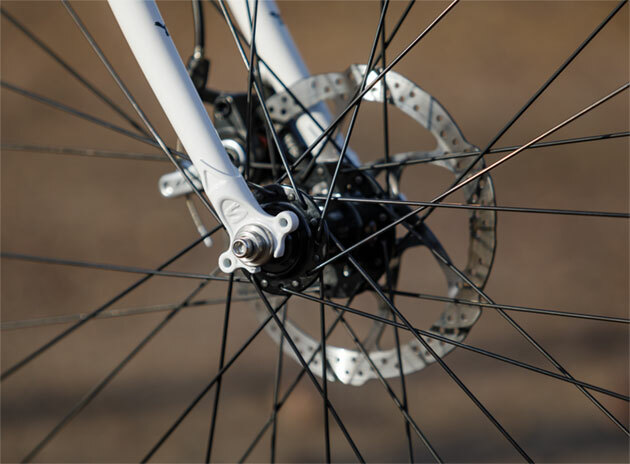 The frame has dropouts for 12mm axles, but will 10mm axles to work? The front and rear dropouts have open ends which allow the use of Surly 10/12 Adapter Washers to run 10mm hubs in the 12mm dropouts. The adapter washers should be used on the inside faces of the rear dropouts to convert the hub spacing from 142 x 12 down to 135 x 10. On the other hand, the washers should be used on the outside faces of the front dropouts to maintain the 100mm spacing but convert the diameter from 12 to 10mm. Are there any aftermarket fork options? The stock fork length is 400mm and the offset is 40 or 50mm depending on which end of the size range you are referring to. There aren’t a ton of aftermarket forks on the market right now with that exact geometry, but it is possible to find forks that are close. For example, a Whisky No. 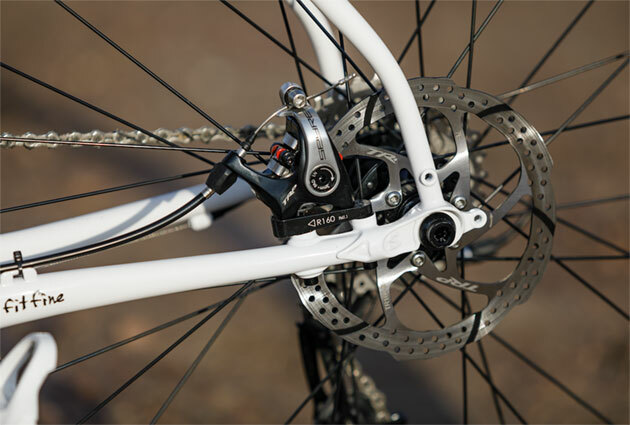 9 CX fork is 395 x 45mm and is compatible with the stock 12mm thru axle wheel and flat mount disc brakes. Additionally, the frame head tube is 44mm which makes it compatible with forks that have straight or tapered steerers. Some people might get hung up about putting an aftermarket fork on their bike that doesn’t exactly match the stock geometry. The most sensitive riders can feel the smallest changes to geometry, but most folks won’t feel a difference or care. If you are concerned, remember that less fork offset increases mechanical trail, producing a feel of more stability, while more offset decreases mechanical trail and makes the steering feel lighter. Additionally, shorter forks will steepen the frame angles, which result in quicker steering feel. I am not going to tell you what is right or wrong. If you have the freedom, I encourage you to try different setups and figure out what you like best. The Midnight Special is going to be a great bike for many different people doing many different things. I personally have been using it as my commuter for the past couple years. My bike has seen many different wheel/tire setups and thousands of miles on every variety of surface. I am 6’3” x 230lb and the Road Plus platform on the Midnight Special speaks to me. I can rip down an off-road path with confidence or glide down the street in a daze. The bike works for me and I hope it works for a ton of other folks as well. 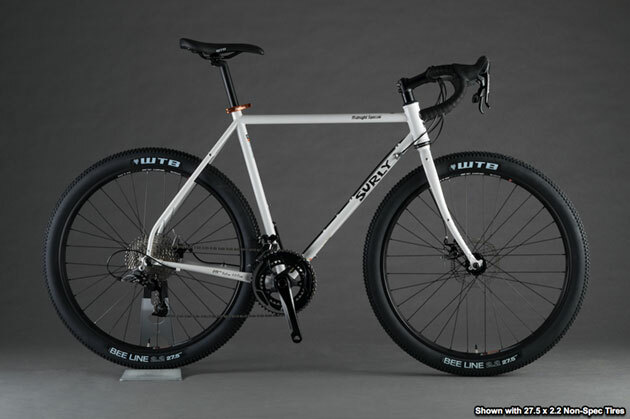 Thor designs frames, tires, and lots of other parts for Surly. He has trouble fitting into most hats, as his head is surprisingly rotund, and he wears flip-flops as soon as it’s warm enough. 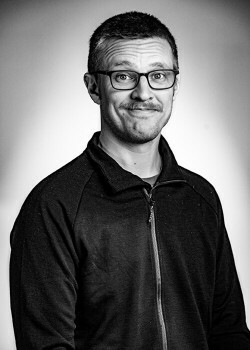 On a bike, Thor rides like normal people can’t, which he always does on platform pedals in Vans with no socks because, and I’m quoting here, “I like to feel everything.” In short, Thor gets rad on a regular basis.